It’s no wonder that independent bookstores flourish in Talbot County, the cultural center of the Eastern Shore. If you’re looking for knowledgeable staff who loves a good read, here are a few of the finest stores. • Crackerjack’s, Easton: A well-curated corner in this old-school toyshop offers a strong selection of books for children from pre-school through elementary school. • Chesapeake Bay Trading Company, St. Michaels: Tucked amid clothing, housewares, and jewelry you’ll find fashionable coffee table books, as well as literary paperbacks. • Crawford Nautical Books, Tilghman Island: This repository of all things maritime offers novels, textbooks, practical navigation guides, not to mention tomes on the Chesapeake Bay. • Mystery Loves Company, Oxford: Here you will find a serious stash of mysteries, along with an owner passionate about all things suspenseful. • Unicorn Books, Trappe. Stacked to the rafters, this is one of Maryland’s largest used bookstores with more than 30,000 volumes, including rare editions. • Vintage Books and Fine Art, Easton. A handsome shop stocked with a superb Maryland collection, along with first editions and vintage maps. 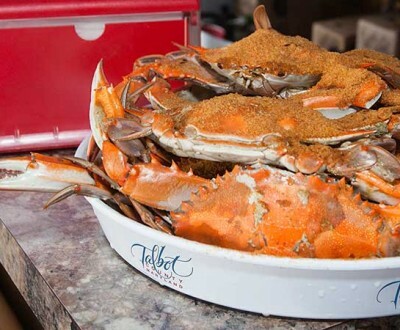 For more information about things to see and do in Talbot County, click here!